Rituals of the ancient festival of Holi are religiously followed every year with care and enthusiasm. Days before the festival people start gathering wood for the lighting of the bonfire called Holika at the major crossroads of the city. This ensures that at the time of the actual celebration a huge pile of wood is collected. Then on the eve of Holi, Holika Dahan takes place. Effigy of Holika, the devil minded sister of demon King Hiranyakashyap is placed in the wood and burnt. For, Holika tried to kill Hiranyakashyap's son Prahlad, an ardent devotee of Lord Naarayana. The ritual symbolises the victory of good over evil and also the triumph of a true devotee. Children also hurl abuses at Holika and pray pranks, as if they still try to chase awayDhundhi who once troubled little ones in the Kingdom of Prithu. Some people also take embers from the fire to their homes to rekindle their own domestic fires. and it is on this day that the actual play of colours take place. There is no tradition of holding puja and is meant for pure enjoyment. The tradition of playing colours is particularly rampant in north India and even in that region, there can be no comparison to the Holi of Mathura and Vrindavan. 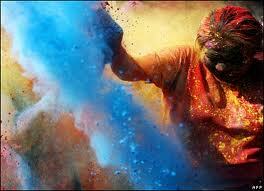 In Maharashtra and Gujarat too Holi is celebrated with lot of enthusiasm and fun. People take extreme delight in spraying colour water on each other with pichkaris or pouring buckets and buckets of it. Singing Bollywood Holi numbers and dancing on the beat of dholak is also a part of the tradition. Amidst all this activity people relish gujiya, mathri, malpuas and other traditional Holi delicacies with great joy. Drinks, specially thandai laced with bhang is also an intrinsic part of the Holi festivity. Bhang helps to further enhance the spirit of the occasion but if taken in excess it might dampen it also. So caution should be taken while consuming it. In south India, however, people follow the tradition of worshiping Kaamadeva, the love god of Indian mythology. People have faith in the legend which speak about the great sacrifice of Kaamadeva when he shot his love arrow on Lord Shiva to break his meditation and evoke his interest in worldly affairs. After, an eventful and funfilled day people become a little sober in the evening and greet friends and relatives by visiting them and exchange sweets. Holi special get togethers are also organised by various cultural organisations to generate harmony and brotherhood in the society.